You know the end of summer is near when the piles of heirloom tomatoes, leafy lettuces, pints of fresh berries and quarts of stone fruit slowly dwindle away from the weekly offering at your neighborhood farmers market. 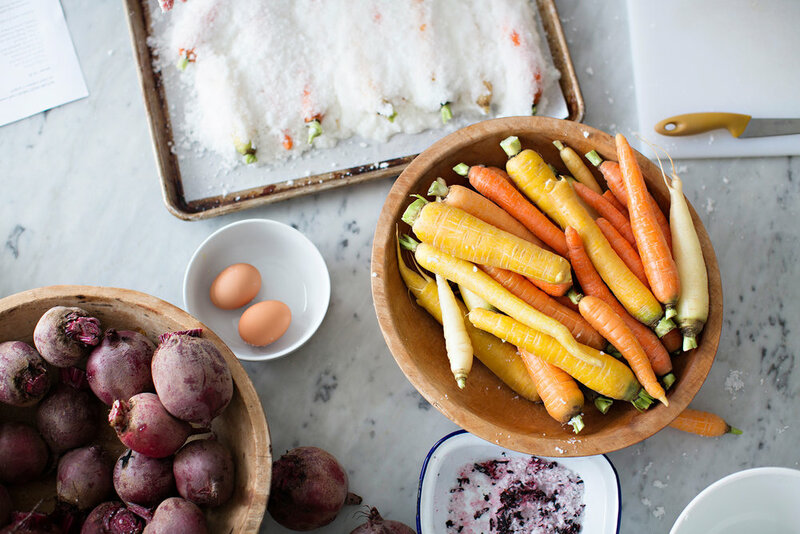 In its place are heaps of colorful carrots, hearty brassicas like kohlrabi and broccoli, golden and purple beets, crisp local apples, and wonky looking varieties of winter squash. Although some of these items like the carrots and broccoli have been around for most of the summer, they receive a new appreciation once the weather has chilled. The possibility of a long and slow roasting or chopping up and tossing into a large stew to release their complex flavors becomes an activity that is looked forward to as the days get shorter and we spend a bit more time at home (and maybe more time cooking!) than we did in the summer months. Autumnal fruits and vegetables have the bonus of being hearty and keeping in your fridge or pantry with a long life if stored properly. This means you can stock up on local root vegetables when the price is right and you don’t have to stress about cooking them in the immediate days following their purchase. This makes it easier to always have produce on hand and being able to whip up a tasty and nutritious meal with the addition of a few pantry staples. Apples: Store your apples in the crisper drawer of your refrigerator with a slightly moistened paper towel on top. Apples give off a lot of ethylene gas, so just one bruised or rotting apple will quickly ripen the others. If you have any apples with soft spots, set it aside to eat or bake. Potatoes: Potatoes are best kept in a cool and dry location in a paper bag or cardboard box. Their ideal temperature range is 45-55 degrees F which can be difficult to find in your home, so you can try to store them in the coolest part of your kitchen or on the steps going down to your basement. Winter Squash: Most winter squash will have been cured before you purchase it and bring it home. This means that the squash sat out in a sunny and dry place for 7 to 10 days just after being harvested. If this has been done well, the squash should last for several months.Squash store best at an even 50 degrees F in a cool dark place and are best to not be touching one another to avoid bruising. Carrots: Cut off the greens - if you are going to use them later (which we recommend!) you can store them separately in a plastic bag with a damp paper towel inside. Place carrots in a container filled with water and place in refrigerator. Whole carrots stay crunchy in this cold water bath. If the water starts to look cloudy swap it with fresh water. Kale: Kale is one of the rare greens that can be washed and preps days in advance without wilting or losing quality. It will stay fresh in your crisper, if kept dry, for over a week. The key is to remove any moisture; You can wrap the greens in a dry paper towel and store inside plastic bag. If you’re not going to use your kale within a week of purchasing you can freeze them and save them for smoothies or cooking later on. You will need to blanch the kale beforehand (cook in boiling water for 1 to 2 minutes, drain, then transfer to ice water), dry kale thoroughly and store in a freezer bag for up to 8 months. Gnocchi - this is a welcome change from the classic pasta staple which is filling and adds great texture to a dish. You can find shelf stable gnocchi at your local supermarket. Lentils - Nutty and earthy in flavor, lentils are inexpensive and are an excellent source of protein and fiber. They bulk up a meal easily and are easy to prepare. Garbanzo Beans - taste great sauteed with greens, lemon, and garlic and topped with a yogurt based sauce. If you have a food processor at home you can even try making your own hummus! Canned tomatoes - the more variety, the better! You can whip up salsa with diced tomatoes, add a hearty layer of flavor to a stew with crushed tomatoes, or make a simple and tasty tomato soup with pureed tomatoes. Newer PostWelcome Our New Dietetics Intern: Tracey! Older PostIt's National School Lunch Week!